Final Five Set in College B.A.S.S. The top five teams who qualified for the College B.A.S.S. final, here on stage, are Virginia Tech, SFA, Georgia, Texas A&M and Auburn. Photo Credit: B.A.S.S. LITTLE ROCK, Ark. — The “Final Five” teams are now one day away from determining the new Mercury College B.A.S.S. National Champion after a hot Day Two, this one spent on Lake Maumelle. And the Auburn University team of Jordan Lee and Shane Powell may have done the most sweating. In addition to the heat, Auburn had to sweat out competition for the fifth spot in Saturday’s final. The Tigers entered the day in eighth place after catching a five-bass limit of 9 pounds, 2 ounces on the Arkansas River Thursday. They followed that with 8-3 on Maumelle to jump into the final qualifying position. The top five College B.A.S.S. final teams from Virginia Tech, SFA, Georgia, Texas A&M and Auburn are briefed on the championship day at Beaver Fork Lake. Photo Credit: B.A.S.S. The top four teams from Day One shifted positions slightly but all stayed in those top four spots after Day Two. They are Virginia Tech, Stephen F. Austin, Georgia and Texas A&M. All five teams will start with zero weight in Saturday’s final at the “mystery lake,” which was named after the weigh-in Friday. Competition will resume on Beaver Fork Lake, a 1,200-acre body of water that serves as a water supply for the city of Conway. The national championship team will compete against each other Sunday to determine the first-ever qualifier for the 2012 Bassmaster Classic, taking place on the Red River out of Shreveport-Bossier City, La., from the collegiate ranks. Virginia Tech's Carson Rejzer and Wyatt Blevins maintain the lead after day two of the 2011 Mercury College B.A.S.S National Championship. Photo Credit: B.A.S.S. 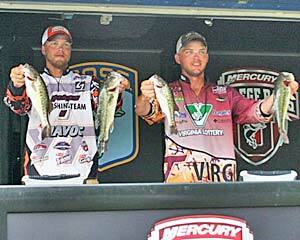 The Virginia Tech team of Rejzer and Wyatt Blevins didn’t have much to worry about Friday. They followed up their first-place weight of 15-9 on the Arkansas River with 8-0 at Lake Maumelle to stay in first place. They had concentrated their practice time on the Arkansas River. It was a strategy that paid off, but it wasn’t easy Friday. Stephen F. Austin’s Ryan Watkins and Andrew Upshaw made a move from third place to second with a two-day total of 20-14. They also had the most successful day on Lake Maumelle, from a fish-catching standpoint. The Stephen F. Austin team was helped by another SFA team that competed in a previous College B.A.S.S. 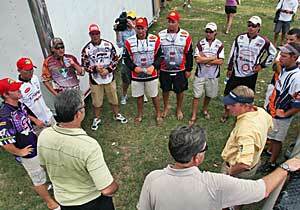 event held on Lake Maumelle. They were told about an underwater bridge near a channel swing, and that’s where they fished all day Friday. They used a variety of baits, including a 6-inch Roboworm on a drop shot, a football head jig with a hula grub, a 5-inch Lake Fork Tackle Flutter Spoon and a Sixth Sense deep-diving crankbait. “We kept changing baits to keep the school fired up,” said Walker, who noted that they also caught two walleye and several white bass in addition to the black bass. Georgia’s Chase Simmemon and Randy Tolbert had the most consistent two-day performance, following Thursday’s 10-7 total on the Arkansas River with 10-6 at Lake Maumelle. They caught their two biggest bass — a 4-pounder and a 3-pounder — on a Pop-R when bass were schooling near the surface. Texas A&M’s Andy Shafer and Weston Brown finished Day Two in fourth place with 20-8. They were using shaky head worms primarily, but also Texas-rigged and Carolina-rigged various soft plastic lures. 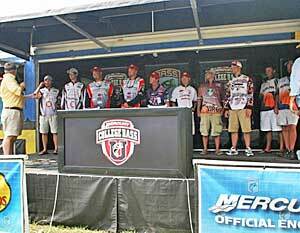 Complete day two standings available on the College Fishing Forum.